Like many of us model car builders, Stev has a warm spot in his heart for the cars of the movie American Graffitti. He set out a while back to build the three key vehicles from that story: The Cowboy's 1955 Chevy, Milner's 1932 Ford 5-Window, and Steve's 1958 Chevy Impala. 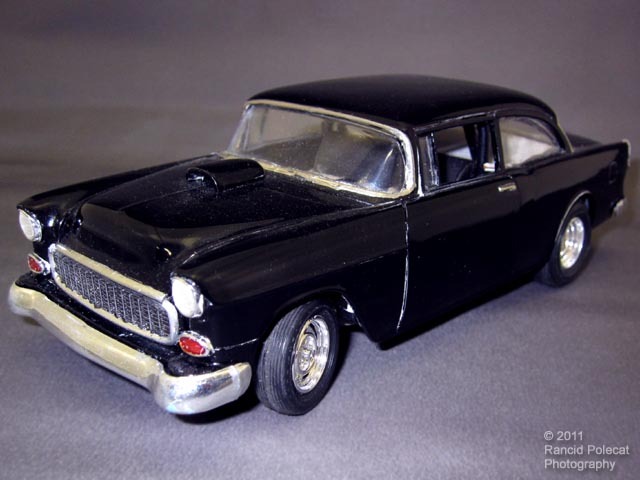 Well, our Steve completed the first one, the black 1955 Chevy Sedan driven by Harrison Ford as Bob Falfa.